Have been racking my brains about the right topic to start with, and I thought it would probably be good to begin at the beginning - implying the Beginning of our Universe. There is a wealth of Astronomical data available in ancient Hindu scriptures. I’ll first share our current knowledge about Astronomy and then we can compare it with the details provided in our ancient texts to get a clear picture about where we stand. Modern Astronomy talks about a Single Universe comprising of Dark Matter and brighter Heavenly bodies like the Galaxies, Stars, Planets, Asteroids, Satellites etc. This entire matter (and anti-matter) is believed to have emerged about 14 Billion Years ago in time, from a momentous explosion called the Big Bang. Many of us may have encountered the number 108 in various ancient cultures.. There are 108 gopis of Vrindavan, Mukhya Shivaganas are 108 in number, Zen priests wear 108 bead rosaries, Chinese and South-Indian martial arts describe 108 pressure points on the body, Stonehenge is 108 feet in Diameter..
Did you know the astronomical significance of this number??? - The distance between EARTH and SUN = 108 times sun-diameter! - The distance between EARTH and MOON = 108 times Moon-diameter! Coincidence?? Or scientific facts that we tend to overlook? Turning to the scriptural descriptions, my personal favorite is Shrimad-Bhagavat Purana because of its extremely scientific approach and I'm gonna use excerpts from this magnificent book to present data that I am sure will blow your mind if you have any interest in astronomy! Inside this literary Masterpiece, one can find descriptions of the different planets from our Solar System and beyond; our Galaxy; different Planetary systems; as well as our ENTIRE Universe! Let's see what it has to offer to an interested reader in terms of Astronomy. Hindu Mythology talks about TWO separate Realms in this Creation - the SPIRITUAL and the MATERIAL. The Spiritual Realm is full of the Effulgence of Supreme Lord that spreads throughout and banishes darkness from each and every corner of this Realm. Religions that envision God as a Being of Bright Light worship the same Brahmajyoti. This Supreme Heaven is believed to be the abode of Supreme Brahman in Vedas, Allah in Koran, Jehovah in Jewish texts, Param Purakh in Sikhism and the King-of-Kings in Bible. This is the Supreme Abode that all souls in the material realm strive for, and reach after attaining Nirvana. Srimad Bhagvatam, calls this the dwelling place of Lord Krishna who resides in His Spiritual abode of Golok Vrindavan. Around this central world, there exist other Spiritual planets that revolve around it like the planets in Solar System revolve around the Sun. 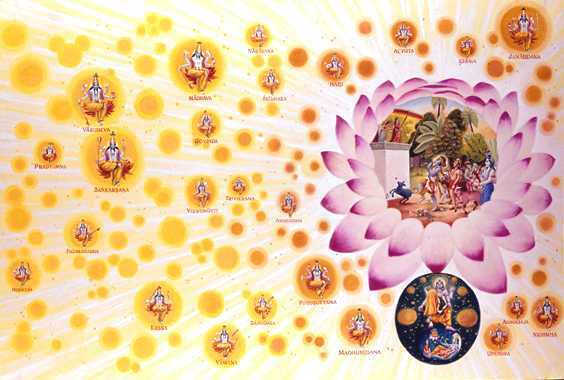 These are collectively known as the Vaikunth planets and each of these is the Divine residence of a Vishnu form. On these planets reside Lord Vishnu's different incarnations alongwith Goddess Lakshmi and the Pure souls who have been able to transcend the bonds of Material Nature. In one corner of this huge bright realm, like a ‘Dark cloud in a clear bright sky’, lies the Material Creation, where Individual Souls like YOU and ME take birth, evolve, exist, eat, earn, reproduce and ultimately die. This realm takes up about 1/4th of the entire space of the Spiritual Realm and is depicted beneath the lotus on the lower right corner of the image below. Even though Material Realm is created for souls who want to live independent lives, the Lord, by means of His infinite expansions, still ensures they can have a smooth sailing. He takes the form of Shri Maha Vishnu for the Creation of this Material Realm and it is from Him that everything in this world emanates. 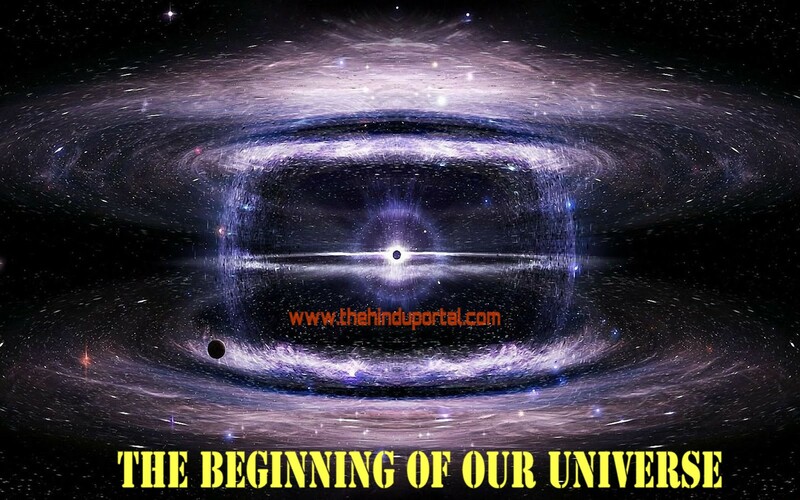 Now there is ONE MAJOR difference in the Hindu notion of the Material world and the current scientific understanding about it - Hindu scriptures state that the Material Realm is composed of Billions and Trillions of Universes (!!) and NOT just a single one!! Scientifically, it is still undetermined whether the universe exists by itself or is just one of the countless trillions within a larger Multiverse, itself contained within the Omniverse that is the Material World. But, according to scriptures, the Universe that we live in, is just a TINY infinitesimal part of the entire Material Creation and all these zillions of Universes are born at the Same Time from the Same Primeval Source - Shri Maha Vishnu. EVERYTIME the Lord exhales, a Universe emerges from EACH of his body pores and with EACH of His inhalations, ALL these Universes merge BACK into His body! The multiple universes generated are floating, and they are scattered all over the Causal Ocean. I was rendered speechless by the larger-than-life imagery inherent in this concept. 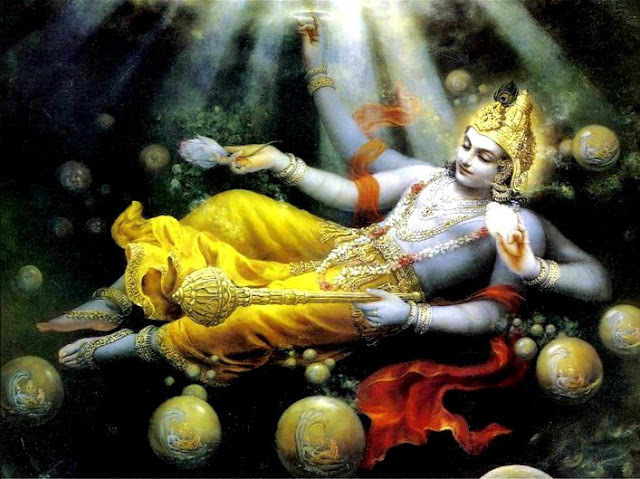 The mere thought of so many Universes taking Birth, Expanding and Dissolving again in Maha Vishnu’s SINGLE breath is fantastic and indeed (to use the pun) breath-taking!! The Great Breath goes forth and returns again. As it proceeds outwards, objects, worlds, and men appear. As it recedes all things disappear into the original source. The Great Breath is, so to speak, the universal and eternal Perpetuum Mobile. If ever there is a Grand description of God in World literature, it has to be this one! How infinitesimal and tiny our entire existence appears to be if we humbly give thought to this notion. Our entire lifetimes are nothing, not even a fraction of a second for Lord Maha Vishnu! 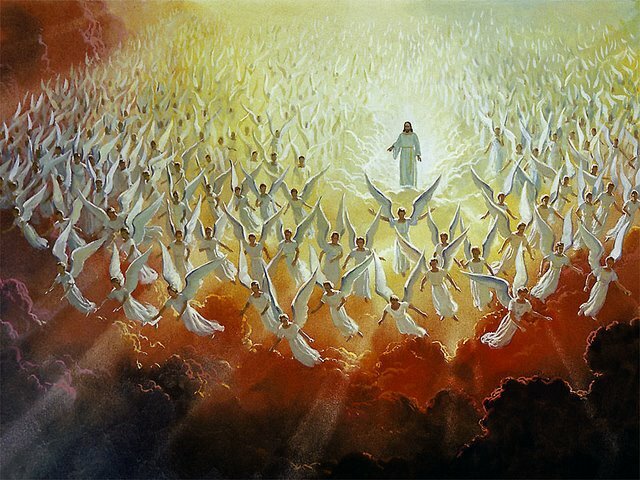 Indeed our entire Universe (which by current estimates is about 13.7 Billion years old), was born with a SINGLE exhalation of the Lord and will merge back into Him with His NEXT intake of Breath!! The concept also fits the Big Bang Theory, as the moment it emerges from Lord Vishnu's body pores is THE moment of Big Bang for each Universe! I wished to check if this fits with our current concept of science in any way and I found data from NASA's WMAP Program (Wilkinson Microwave Anisotropy Probe) which has been studying the cosmic microwave background in the Universe. This CMB is basically the light emitted by our Universe when it was just 400,000 years old. The study of this data which is being collected since 2001 suggests that apparently, new universes could be created spontaneously from what we perceive as empty space! The support for this view also comes from the observation of the 2nd Law of Thermodynamics or the Law of Entropy that states that each closed system (like our Universe) has a tendency to get into disorder spontaneously (hence it's expansion) - this implies that to begin with, the Universe was in an ordered state! Caltech astronomers studying this CMB data claim that this initial order is entirely possible if the so called Big Bang happened in the cold space of a previous Universe. Imagine then, Lord Mahavishnu lying in the cold dark material realm, surrounded by this empty space, giving rise to multiple universes including our own! After exploding out of the body of Sri Maha Vishnu, each Universe continues to expand, and after reaching a critical threshold, again begins to contract until it is assimilated back in the body of Lord Maha Vishnu. I thought this was probably one isolated example of the mention of a Multi-verse and maybe was not intended in the way I was interpreting it. But to my surprise, the concept of Multiple Universes is widely accepted and acknowledged in Hindu Cosmology! There are Innumerable Universes besides this one, and although they are unlimitedly large, they move about like atoms in You. Therefore You are called 'Without-limits'. Unlimited universes pass through the pores of Your body just as particles of dust pass through the openings of a screened window. 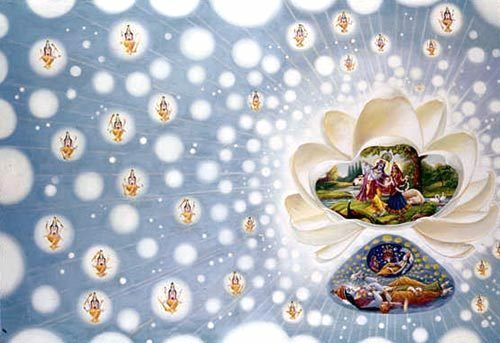 My dear son, I, Lord Brahmā and the other devas, who move within this universe, cannot exhibit any power to compete with the Supreme Personality of Godhead, for Innumerable Universes and their inhabitants come into existence and are annihilated by the simple direction of the Lord Hari. 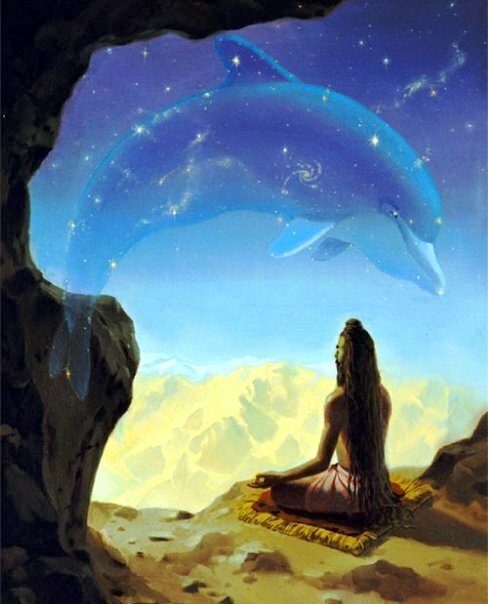 And who will search through the wide infinities of space to count the universes Side by Side, EACH containing its Brahma, its Vishnu, its Shiva? Who can count the Indras in them, ALL those Indras Side by Side, who reign at once in all the innumerable worlds; those others who passed away before them; or even the Indras who succeed each other in any given line, ascending to godly kingship, one by one, and, one by one, passing away? Hindu scriptures declare there's Intelligent life out there, and this is gotta be absolutely the FIRST mention of ALIENS in World Literature ever!! 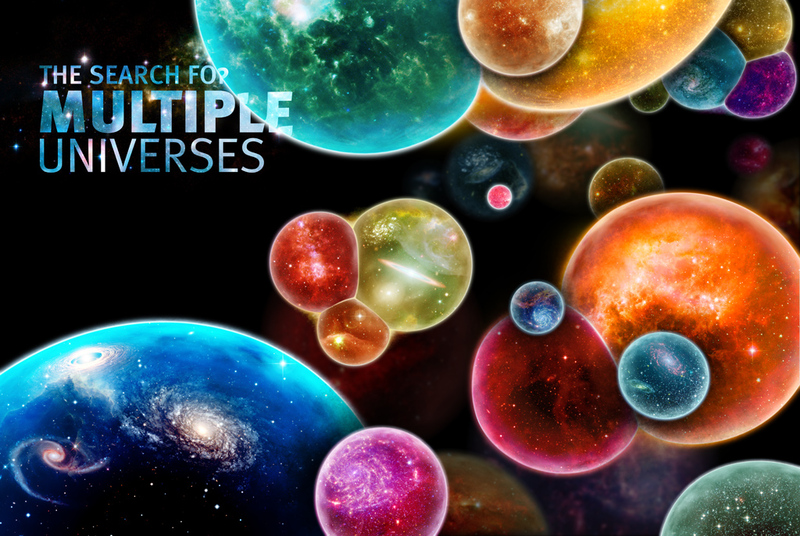 The obvious take-away from this concept is that according to the scriptures, there exist MORE than One Universes in our Creation and this topic has long been debated by modern Scientists. Let us see what our current notions of scientific theory have to say about it. A large body of Scientific intelligentsia believes in multiple Universes existing perhaps in parallel dimensions. 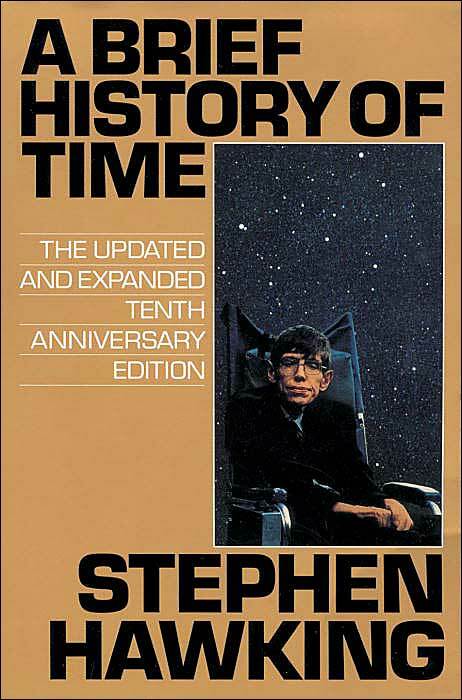 Here, I would like to introduce you to perhaps the most brilliant mind of our times - Stephen Hawking, whose phenomenal work - A Brief History of Time, is by far the most important book on Space Science ever. Simply put, it states that, the likelihood of development of our Single Universe from the big-bang is much less than the likelihood of Multiple Universes being born out of it!! What is interesting for me is that the﻿ mention of Multiple Universes comes from the scriptures much BEFORE modern Science came to terms with accepting their existence. 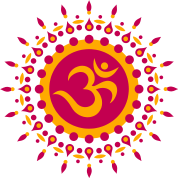 Short of Time-Travel, the ancient Yogis could only have grasped the basic nature of our Universe through their rigorous meditation and penance! Till now, Science has been unable to tell us, what existed BEFORE the Big Bang. WHERE did the explosion take place if there was nothing before it happened?? WHAT caused the explosion in the first place?? But if we grasp the concepts from Srimad Bhagvatam we can understand the Science as well as Faith behind this. The Scientific Spirit of ancient Rishis makes me bow down in reverence and if you read the texts with an open mind, will amaze you with their profound philosophical insight as well. Our ancient beliefs are not just Myths, but Parables for explaining profound Scientific principles to the common man. We will cover more such interesting topics in the Posts to follow and I will try to touch upon as many diverse scientific disciplines as I can use to understand and decode the myths and legends from ancient Hindu tradition. There was yet no Air nor Sky spread. So what was covering? Where was it present? Was Water there, in the unfathomable depth? Of Night or Day there was yet no sign. Other than HIM was nothing divine. And All was Water indistinguishable, Dark. Rising at last, by the power of Thought. The primal seed, born of the Mind. Sages have found all this in their Heart. Know what was below, and what above. Below was Strength, and Creative-will above. Who really knows? Who can declare? When did it happen? How Creation came on? Even the Devas came after its emergence. So who truly knows, Whence it was born? He surely knows or maybe even He does not!